You can reorder the structure of the active document using Drag & Drop in the Headings panel of the Atlantis Control Board. 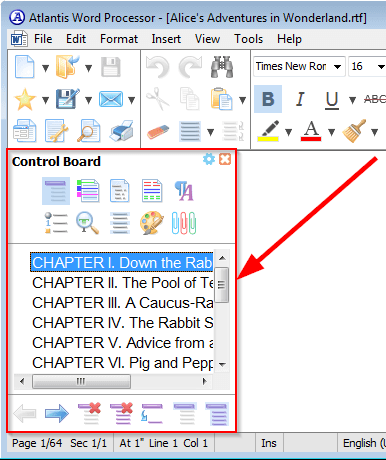 Dragging the panel items up or down automatically moves the corresponding headings and their associated text up or down the document itself. 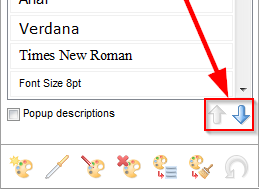 Dragging in a horizontal direction promotes or demotes the corresponding heading(s) in the active document. Add new format Creates a new blank format which initially includes no formatting characteristics. Use the Edit properties of highlighted format button (see below) to assign a name for a newly created format, and specify its formatting characteristics. Pick new format from document The mouse pointer is replaced with a special "Format Picker" pointer . When this mouse pointer is displaying, you can click any location in your document formatted in the desired way to pick the font formatting characteristics from that location, and create a new item in the Format Palette initialized with the picked formatting characteristics. When this mouse pointer is displaying, you can press Esc or click the Pick new format from document button again to revert to the normal mode (to the standard mouse pointer). 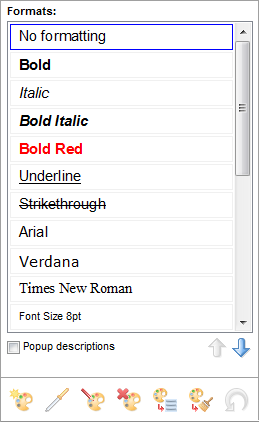 Edit properties of highlighted format Displays a menu allowing to change the name of the highlighted item of the Format Palette, its font formatting or paragraph formatting characteristics. 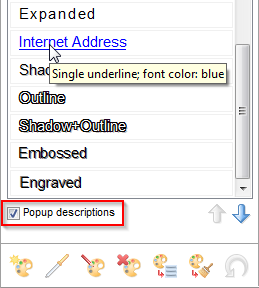 This menu also allows to assign a hot key to the highlighted item of the Format Palette. 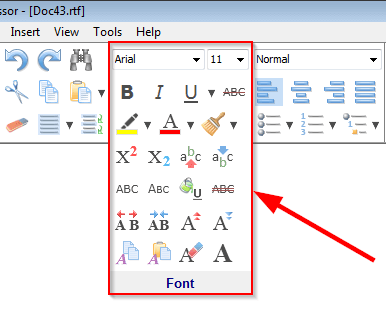 When a hot key is assigned to an item of the Format Palette, the corresponding formatting characteristics can be applied at one go to any selection in the document window, simply by pressing the assigned hot key. Delete format highlighted above Deletes the highlighted item from the Format Palette. Note that this operation cannot be automatically undone through the Undo command of Atlantis. However, you can restore a deleted clip from the Windows Recycle Bin if necessary. This is of course if you haven't disabled the Windows Recycle Bin on your system. Apply highlighted format to document selection Applies the highlighted format to the document selection. You can alternatively double-click the desired format of the Format Palette. Switch on Format Brush and load highlighted format When the Format Brush mode is off, switches the Format Brush mode on, and loads the highlighted format onto the Format Brush. Otherwise switches the Format Brush mode off. Restore default Format Palette Restores the default Format Palette items which were available immediately after you installed Atlantis. Note that the Format Palette is also available as a drop-down menu attached to the Format Brush button of the Font toolbar .